Find the latest GIS apps by Esri partners and distributors at Esri ArcGIS Marketplace. Find them with Voter Gravity. During the 2014 midterm elections, candidates and campaign managers used Voter Gravity to locate potential voters and direct canvasing activities. Voter Gravity provided an extensive database of US voter information. In more than 35 states, campaign staff accessed data to tag and map potential voters by characteristics such as party, audience, and issue. See voter information at the neighborhood level and manage canvasing activities. Canvasing coordinators quickly created up to 500 walk list maps at a time and published them as apps. Volunteers canvasing neighborhoods downloaded their assignments to their devices, turned on the map, and found the next prospect. The app included a script and a survey form. Coordinators adjusted assignment maps on the fly. The app sent information back to the Voter Gravity platform that published maps with survey results in real time. Voter Gravity kept survey information organized even during the frenzy of the final week’s lead-up to Election Day. Placemeter shows how space is used and by how many people. Using live video feed, it recognizes and reports vehicle and pedestrian street traffic, which can be used in GIS to analyze shopper behavior. 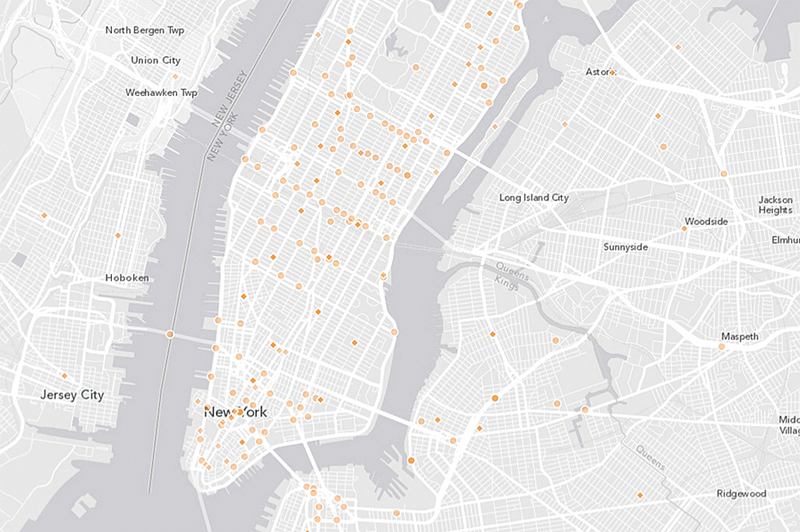 Cameras at these sites link live video feed to Placemeter for analysis. For example, a camera mounted on the third floor of a downtown Manhattan building focused on the retail store across a busy street in Times Square lets the store manager see if the store is effectively attracting people walking by its doors. The camera’s live feed links to the Placemeter platform. In real time, Placemeter recognizes and labels each vehicle on the street as a truck, taxi, or van and shows its speed. It counts how many pedestrians pass by the store’s display window and reports how many slowed down to look at the display window. Placemeter computes how many people go into the store, come out of the store, and how long they are inside. These metrics are displayed on a GIS map. Placemeter uses Esri tools to create advanced analysis, define custom polygons, and aggregate statistics. It generates density information on a map to show how people move through the city throughout the day. An investor might use this information to see the traffic potential of a prospective location. Transportation departments can use Placemeter to determine which sections of road are most traveled by heavy trucks. Marketing researchers can use it to assess patterns and analyze customer behavior. Urban planners can ensure the safety of nighttime bicyclists and joggers by determining where more lighting might be needed on streets and paths. Businesses use Sensimob to connect field teams with one another. The app combines text messaging, mapping, and data collection functionality on a secure platform. A field team’s communication history, tracking information, and the data it collected can be visualized on a map. 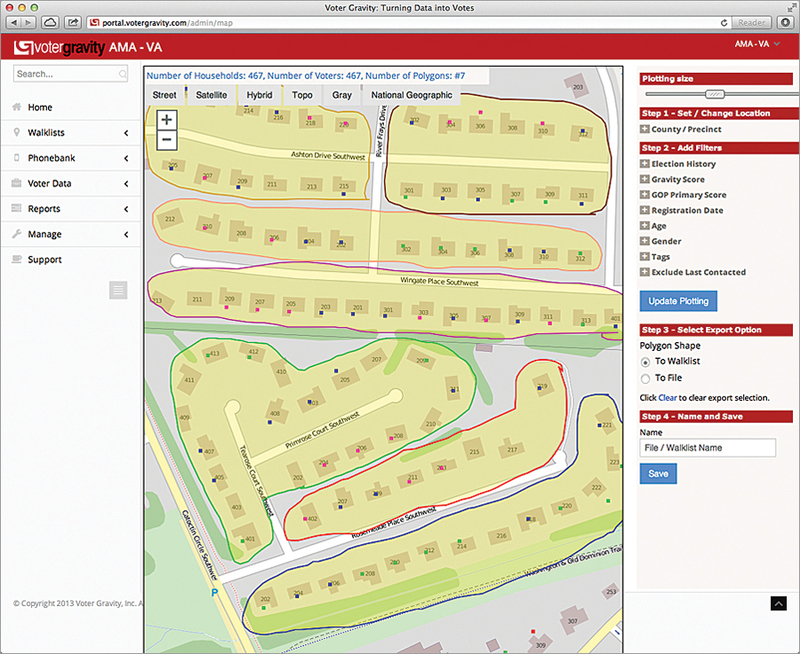 Tracking and communication history data layers can be combined with other data to make GIS-based decisions. When Brazil conducted a national traffic inventory, the Department of Transportation used Sensimob to coordinate its field teams. The department assigned 2,000 workers to street corners around the country to count traffic. Managers used Sensimob to direct teams via text messaging and maps. On those maps, managers drew geofences around dangerous areas so an alert would be triggered if a worker crossed the boundary. A dashboard gave managers an overview of activities and helped ensure that workers were in their assigned areas. Using smartphones, workers could view their current location, assigned areas, and the location of nearby workers. They could communicate with other workers via text messaging supported on a secure platform.